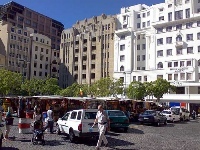 Situated in the Central Business District, near the main station, Greenmarket Square is the perfect spot to observe South Africa's diverse population in all its hues and voices. Once the scene of slave markets, this is now the site of one of the city's most vibrant flea markets, where clothing, jewellery, trinkets, and souvenirs are on sale most days. Tourists and business people rub shoulders in the many sidewalk cafés that surround the busy cobbled square. Be prepared to haggle at the market to get the best prices but be warned, touts are prevalent. Rain doesn't generally deter the stall-owners at Greenmarket Square and, in bad weather, the stalls tend to just be covered with waterproof tarpaulins. If at all, possible try not to appear like a tourist (visible cameras, maps etc) as the merchants tend to target and overcharge foreigners much more than locals. As many stalls sell similar goods, don't be shy to compare prices, not least of all because it will motivate the owners to lower costs. The market stalls generally start clearing up for the day in the late afternoon, sometimes as early as 3pm, but seldom before that. The market does not operate on Sundays. There are many other great attractions in the area, including several art galleries and museums. For instance, on the west side of Greenmarket Square is the Old Town House, dating from the mid 18th century, which is a wonderful example of Cape Dutch architecture and houses the Michaelis collection of Dutch and Flemish landscape paintings.